Speed up your company's profit margin with a little added 'injection' with these Syringe Pen with Logo Branding. 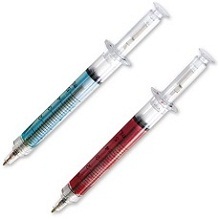 Filled with a blue or red imitation fluid, the branded syringe pen looks almost like the real thing other than it doesn't have a needle! Push the plunger and you get your pen - filled with blue ink inserts - its documental quality ink that will stand strong with the test of time to ensure your corporate brandname and logo exposure gets seen! Its a fitting promotional alternative for vets and the medical industry, as customers are certain to remember your brand-name and logo! Customise these Syringe Pen with Logo Branding with your own artwork and hand out to customers and clients to ensure future business! Why not have a look a our Printed Pens department for more excellent promotional gift pens.